It is the most common of the sulfides and can be formed in environments such as: magmatic segregation, in the form of accessory in igneous rocks, in contact metamorphism, sediments, in volcano - sedimentary massive deposits, and in hydrothermals of low temperature . It is presented as cubic form, isometric, in the form of cubic crystals pyritohedron and octahedral. Texture: Between conchoidal and uneven. Properties: Easily limonitiza. It is the Sulfur more hard, paramagnetic and geological thermometer. As chrysocolla, pyrite is used for jobs such as spheres, drums, eggs, hearts and others. 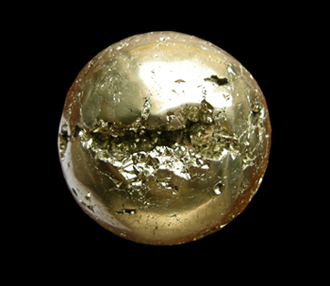 It is also used in jewelry and bijouterie. PERUVIAN MINERALS & JEWELRY S.A.C.,has its own workshops where we manufacture the products from handmade to provide high quality finishes. We have the capacity to supply big quantities of rough pyrite: mass, in coconut and granulated.